Injured civilians receive cooking oil brought from the Ujina Police Station for treating their burns at 1100 hours at the west end of Miyuki Bridge, Senda-machi District, 1.42 miles (2300 meters) from the hypocenter. 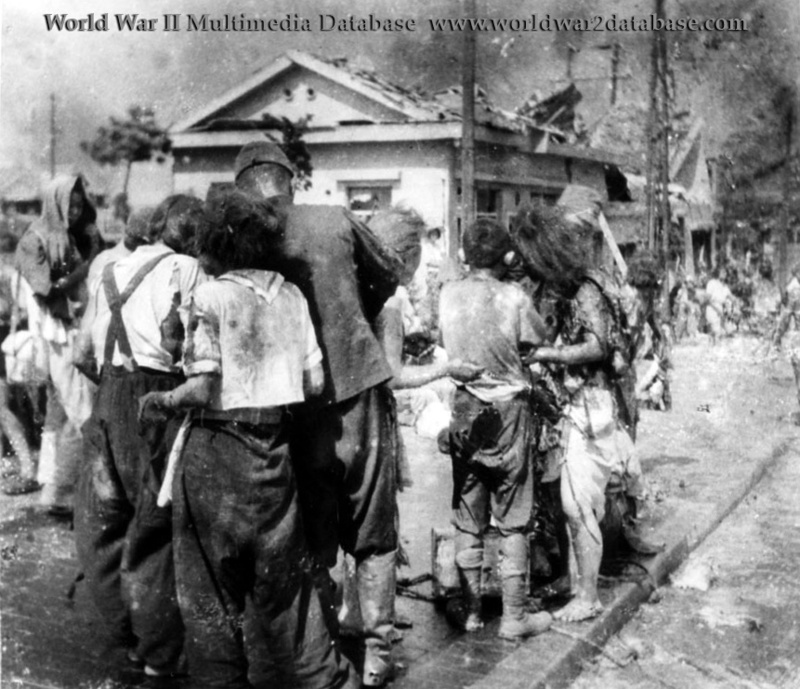 They are mostly middle school students from Hiroshima Girls' Commercial School (mobilized to work at the Hiroshima Savings Bureau), and students of the Hiroshima Municipal Junior High School (detailed to demolishing buildings for firebreaks.) Towards the right and beyond is the center of Hiroshima City, and the raging fire is creeping up. Both ends of this bridge, which was the longest one in Hiroshima at that time, were filled with burned and injured students. Photographer Yoshito Matsushige walked through Nagarekawa, Hatchobori, Kamiya-cho, and other parts of the city center for hours. He said, "A policeman took off the lid of an oil can and started to give first aid treatment to the people with burns, but the number of the injured increased rapidly. I thought this must be photographed and held the camera in position. The scene I saw through the finder was too cruel. Among the hundreds of injured persons of whom you cannnot tell the difference between male and female, there were children screaming 'It's hot, it's hot!' and infants crying over the body of their mother who appeared to be already dead. I tried to pull myself together by telling myself that I'm a news cameraman, and it is my duty and privilege to take a photograph, even if it is just one, and even if people take me as a devil or a cold-hearted man. I finally managed to press the shutter, but when I looked the finder for the second time, the object was blurred by tears." A Chugoku Shimbun photographer who was also an army news team member at the time, Matsushige was trying to get to his newspaper company and the army command office. In the end, Matsushige was able to take two pictures at the bridge. Out of twenty-four exposures available on two rolls of film, he was only able to take seven photos on August 6, of which five were developed successfully. With all of Hiroshima's darkrooms destroyed, he developed the photos that night in the open, washing the prints in the river, choked with corpses and debris.